* keyboard shortcuts: select a search result or move to the next result without using your mouse. You'll like it if you use shortcuts in Gmail or Google Reader, but it's hard to understand why Google thinks that the ads placed at the top of the page are search results. * two similar experiments: put the search navigation at the left/right of the page. This is somehow similar with Ask.com's new interface and Yahoo's search assistant because it makes it easy to explore a domain and provide better queries. You can only choose one experiment at a time, it's easy to switch between them or deactivate them and there's an option to send your feedback. I'm still undecided between the keyboard shortcuts and the left-hand search navigation, so it would be nice to choose two or more non-conflicting experiments. "between the keyboard shortcuts and the left-hand search navigation"
I'm sorry to disappoint you, but this feature is new*. Google Experimental was launched in May, but you couldn't actually join an experiment. You could just bookmark a page or change your browser's settings to go to one of the experimental UIs. *Proof: Google Cache (October 3 - no option to join an experiment). For me the best experiment is the left side menu. FOr this one feature, I had started using ask.com. Good that google is looking at these other options. 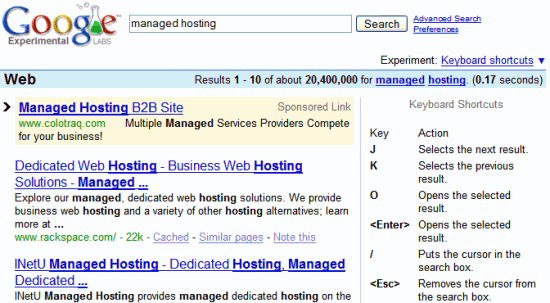 But I still think, Ask.com's search results are better organized. Just try to search baseball and you will see the difference. 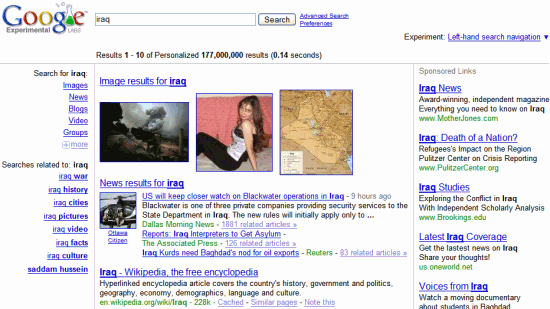 PS: I am not talking about the actually search query results but organizing the info on the search page. I agree, Ask.com has a great interface and some of its elements are already included in other search engines (video previews - Live Search, search assistant - Yahoo), but I think it should remove the clutter and try to focus on relevance  and freshness , two important lacks that make Ask.com a minor search engine. - [google street view] - the top result should be a link to Google Maps, a page from the help center. - Microsoft's recently launched HealthVault seems to be missing from a search for [health vault].